Are you missing out? 4 Easy Facebook Hacks So You’ll Never Miss Out Again! 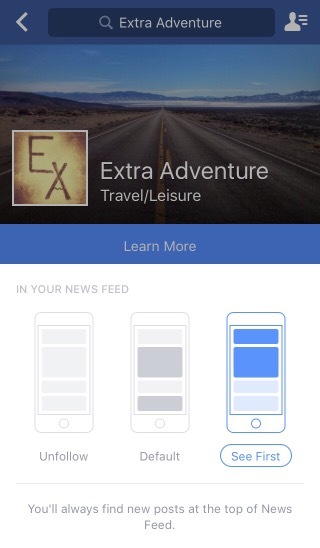 Some of my readers have been complaining that, although they “Like” and follow Extra Adventure on Facebook, they have missed out on some time-sensitive deals, haven’t heard about some of the great travel hacking opportunities I’ve shared, or haven’t even seen any of my original blog posts. Because, Facebook wants more money. They say it’s because there is so much competition for space in your newsfeed, they can only show you so many stories before you become overwhelmed. While that may be true, they certainly have no compunction against showing you posts that have paid to be there been “sponsored”. The number of people who are shown a post is called the “reach”. Reach is either organic, or paid. The organic reach of pages has been steadily declining. (I think this is in direct inverse correlation to the number of times Facebook has prompted me to pay to “boost” my reach.) A recent study pegged average organic reach at 2.6%. Oh, and that reach doesn’t even necessarily include people who like/follow a page. eg: Joe follows a page. So do 350 other people. The page posts something. Joe gets that post in his Newsfeed and clicks “like”. 8 of Joe’s friends get a “story” in their newsfeed that says “Joe ‘liked’ a post”. That post has organically “reached” 9 people. 99% of that page’s followers will not be shown that post. As a page, I can pay to reach an audience, I can even pay to reach my followers. But why should I have to? Why can’t you just see what you want to see? You can hack the system and see the posts you want to see! Go to the page you want to see more posts from. Look for the “Like” button with a little down-arrow on the page’s cover photo. Hover over that button, a drop-down menu will appear. That’s it! Now every time that page posts something, it’ll show up at the top of your newsfeed. It’s not foolproof, though. Make sure you refresh your newsfeed every once in a while or go and check out the page just to make sure you haven’t missed anything. If you want to be absolutely sure, see Facebook Hack #2. Click “All on” or the little pen icon in the right corner of the drop-down menu. Choose which notifications you’d like to see. That’s it! 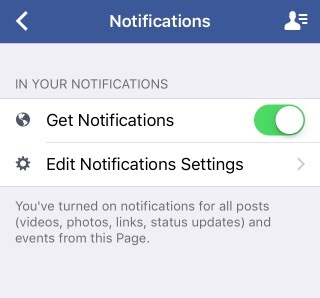 Now every time that page posts something, you’ll get a notification here. Click on some of the posts. “Like” some of the posts. That’s it! Now Facebook’s algorithms will know you want to see more from this page. Your activity may also show up in your friends’ Newsfeeds (increasing the post’s reach) and thereby boosting the likelihood you’ll see more due to its popularity. If you feel like you haven’t seen much from a page you like recently, go check it out and interact some more. The effect doesn’t last long. You need to keep this one up. 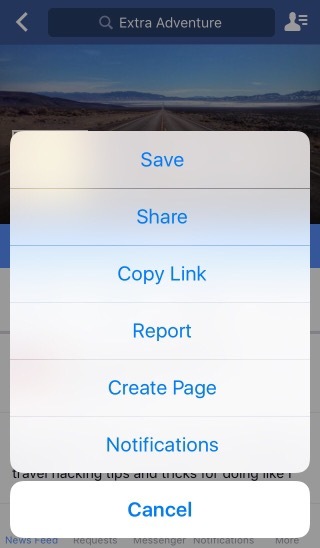 Make your own Newsfeed by creating a list of the friends and pages you want to see posts from. This is a great option if you have just a few key friends and pages that you don’t want to sift through your whole Newsfeed to find. It’ll give you all their posts, in chronological order! Scroll down to Friends on the left side of your News Feed. Hover over Friends and click More. Select or type the names of friends you’d like to add. Select or type the names of Pages you’d like to add. That’s it! Now you can add this list to your Favourites in the left side-bar, and click on it any time you want a more customized Newsfeed than what Facebook decides to give you. Facebook doesn’t always know best. Sometimes you have to tell it what you want to see. Hopefully, these 4 easy hacks will get you seeing what you want to see and not missing out on another Facebook post from Extra Adventure, or any other friend/page you follow. If you give up on Facebook entirely, don’t forget, you can click the “follow” button on this blog to get my original posts by email. You can also follow me on Twitter, Instagram, and YouTube!